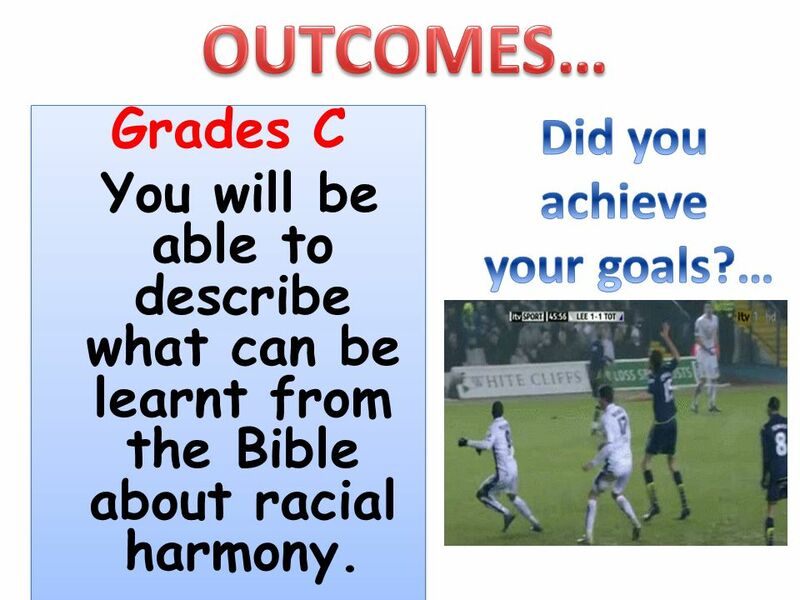 OBJECTIVE: To use quotes from the Bible, the teachings of Jesus and the work of Martin Luther King Jnr to understand Christian views towards racial harmony. 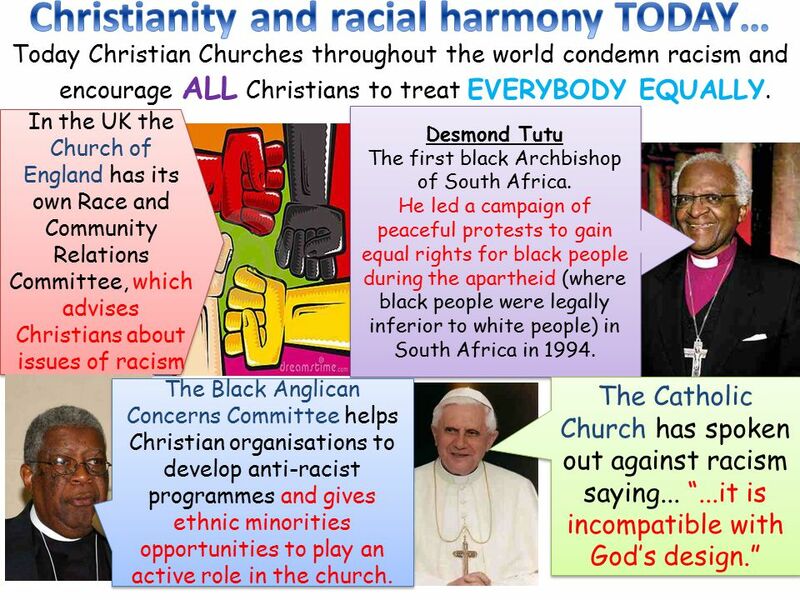 1 OBJECTIVE: To use quotes from the Bible, the teachings of Jesus and the work of Martin Luther King Jnr to understand Christian views towards racial harmony. 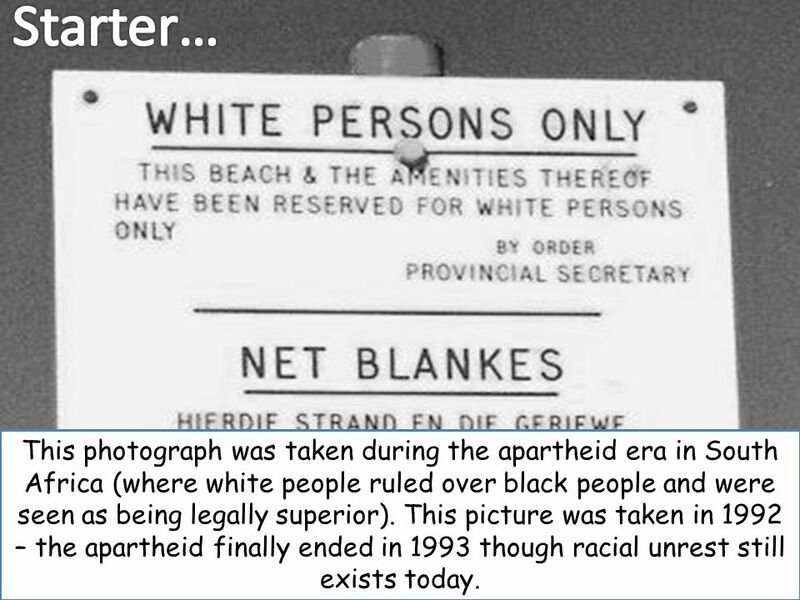 3 Starter… This photograph was taken during the apartheid era in South Africa (where white people ruled over black people and were seen as being legally superior). This picture was taken in 1992 – the apartheid finally ended in 1993 though racial unrest still exists today. What is the purpose of this sign? How do you think it made (i) black people and (ii) white people feel? Explain your answers. When do you think this was taken? 9 Christianity is opposed to racism. What does this tell us about how Christians should view racism? 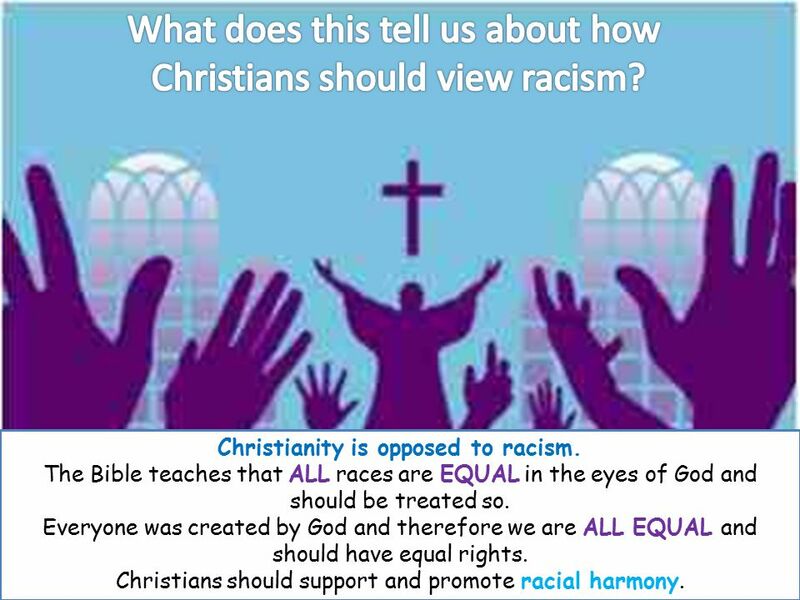 Christianity is opposed to racism. 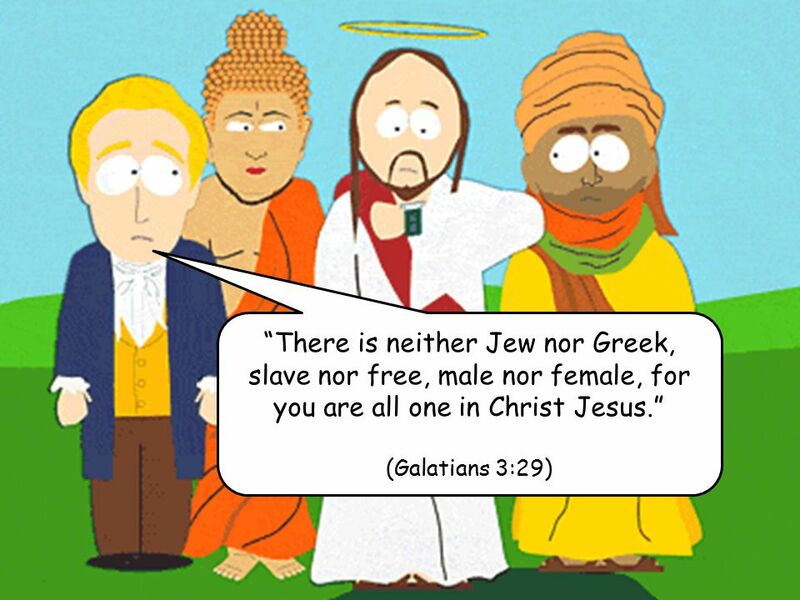 The Bible teaches that ALL races are EQUAL in the eyes of God and should be treated so. Everyone was created by God and therefore we are ALL EQUAL and should have equal rights. 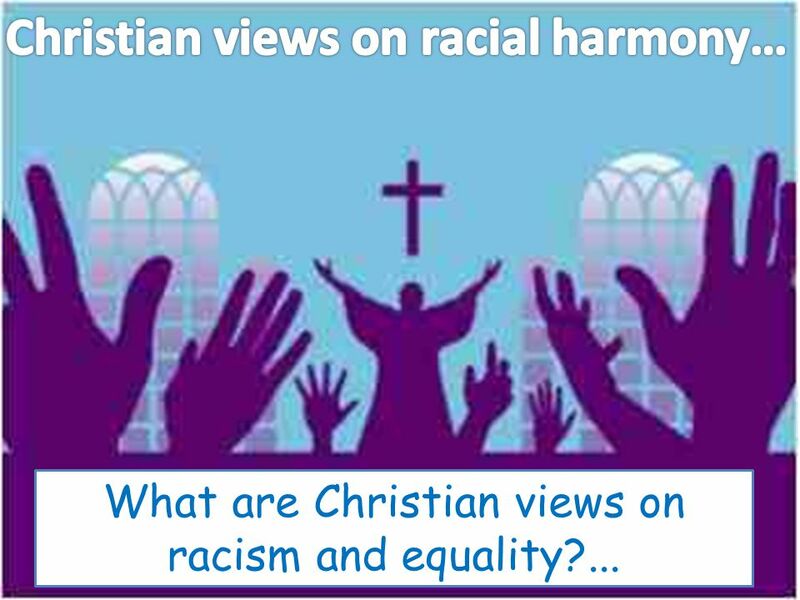 Christians should support and promote racial harmony. Teachings of Jesus always treated people in the same way, no matter where they were from. His most famous teaching “Love your neighbour as yourself” looked to promote racial harmony. 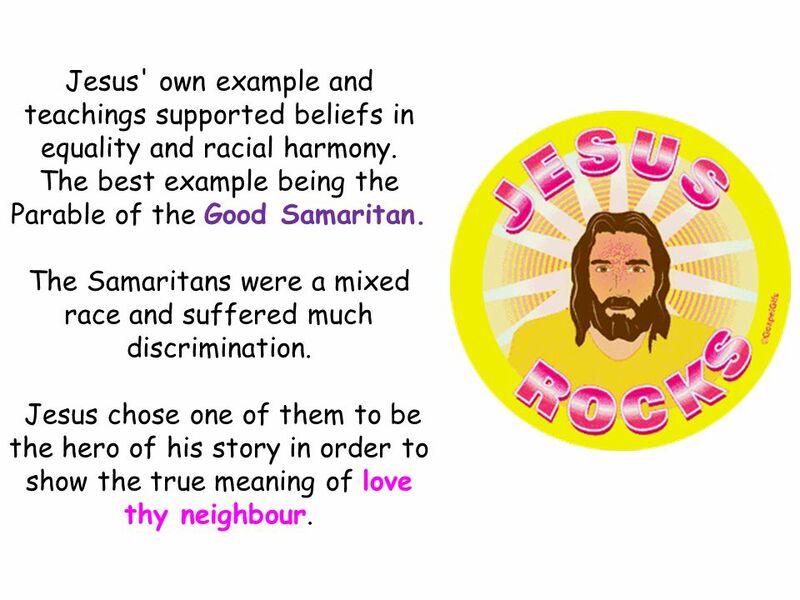 13 Jesus' own example and teachings supported beliefs in equality and racial harmony. 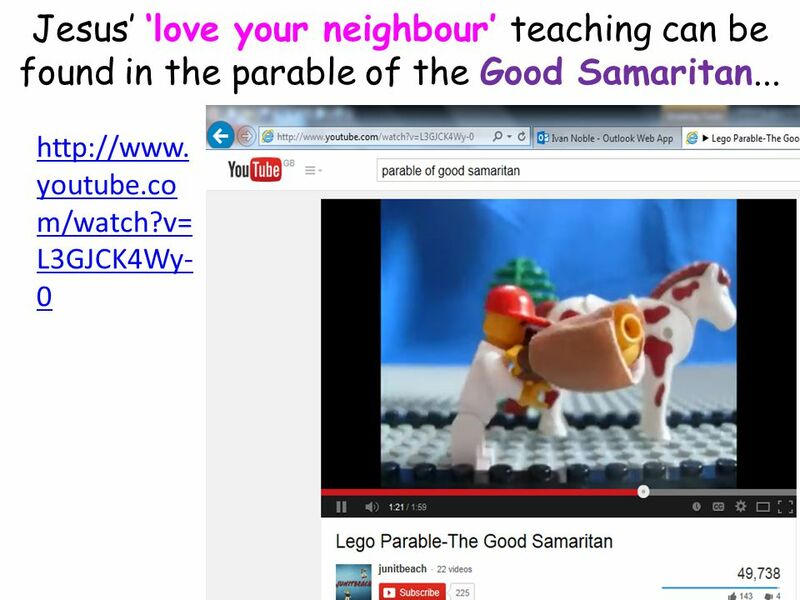 The best example being the Parable of the Good Samaritan. The Samaritans were a mixed race and suffered much discrimination. 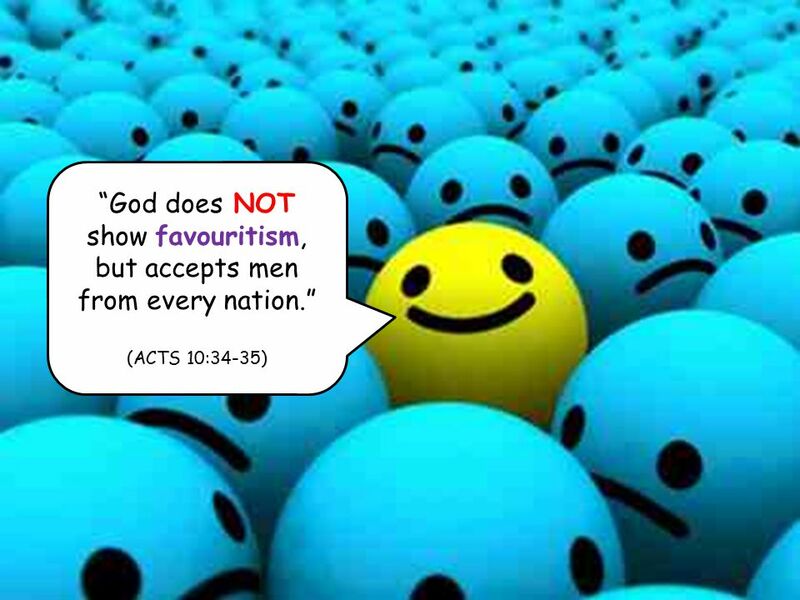 Jesus chose one of them to be the hero of his story in order to show the true meaning of love thy neighbour. 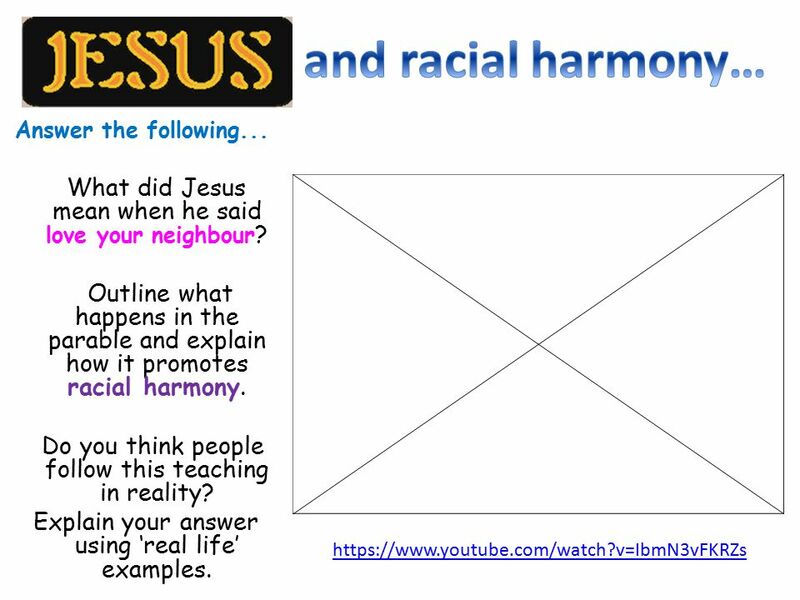 14 and racial harmony… Answer the following... What did Jesus mean when he said love your neighbour? 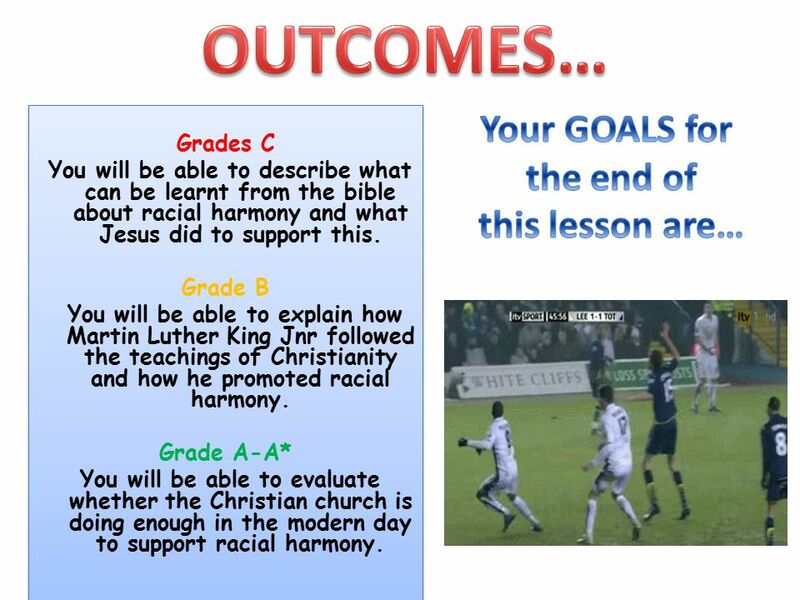 Outline what happens in the parable and explain how it promotes racial harmony. Do you think people follow this teaching in reality? Explain your answer using ‘real life’ examples. 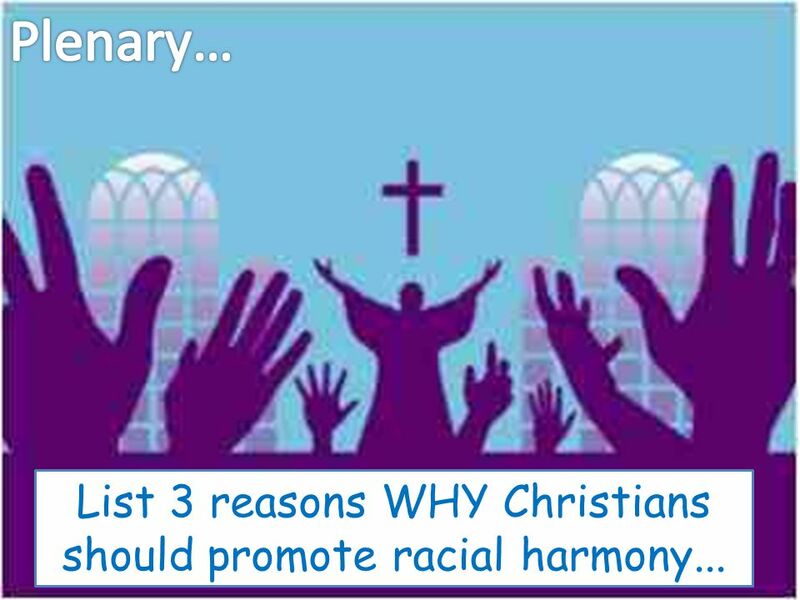 15 You will be able to describe what Jesus did to support racial harmony. 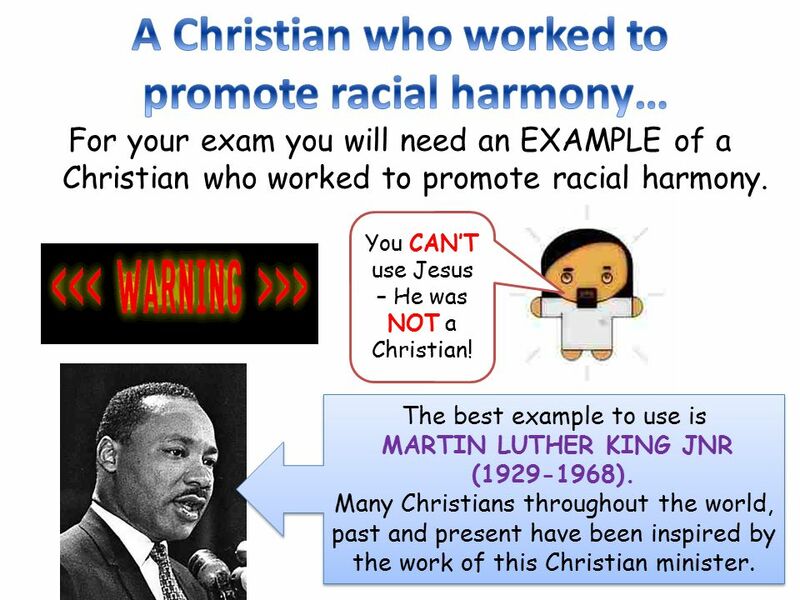 For your exam you will need an EXAMPLE of a Christian who worked to promote racial harmony. You CAN’T use Jesus – He was NOT a Christian! 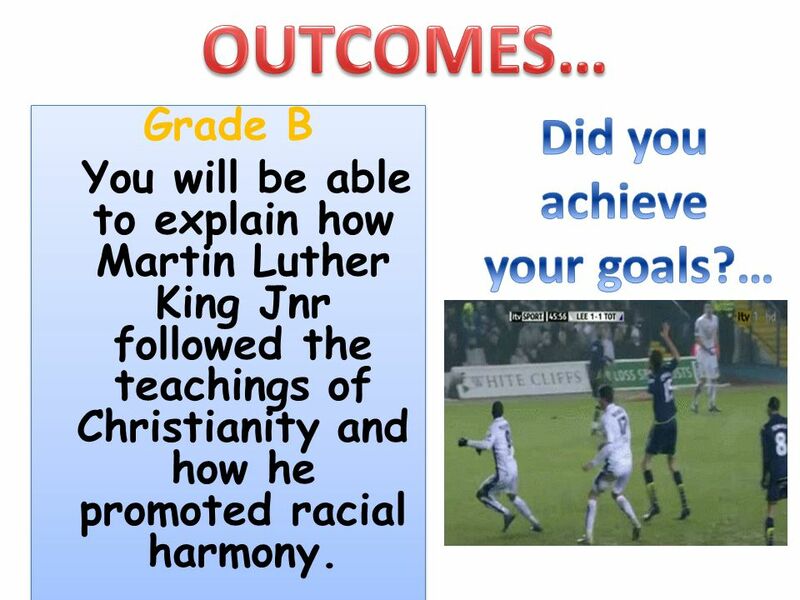 The best example to use is MARTIN LUTHER KING JNR ( ). Many Christians throughout the world, past and present have been inspired by the work of this Christian minister. 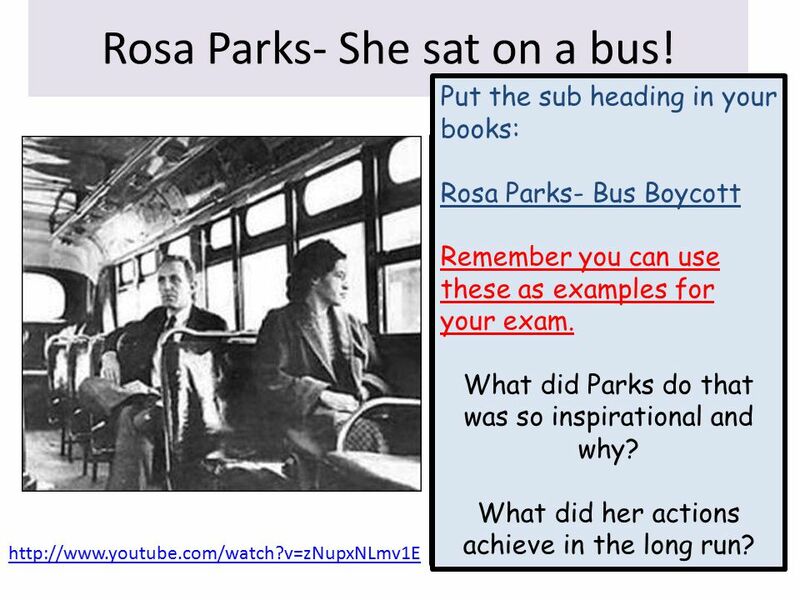 17 Rosa Parks- She sat on a bus! 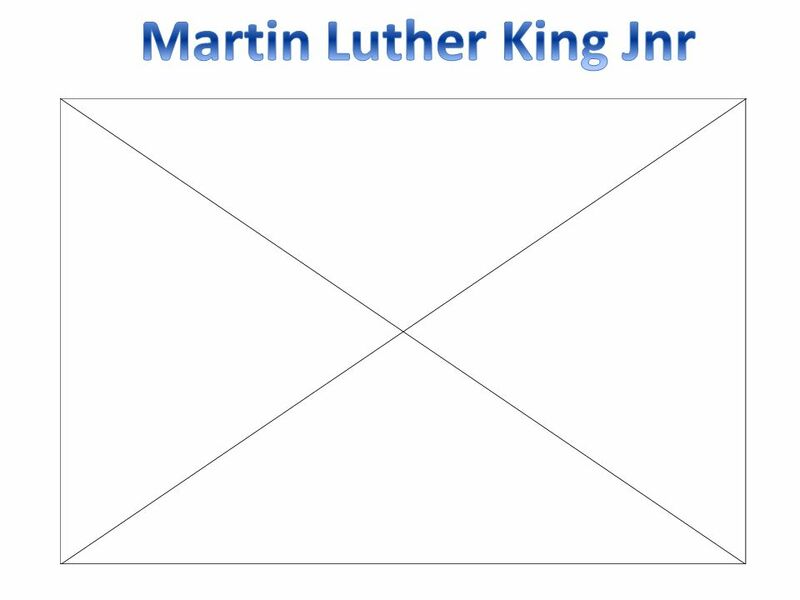 18 How did Martin Luther King promote racial harmony? Watch the biography and complete the diagram. 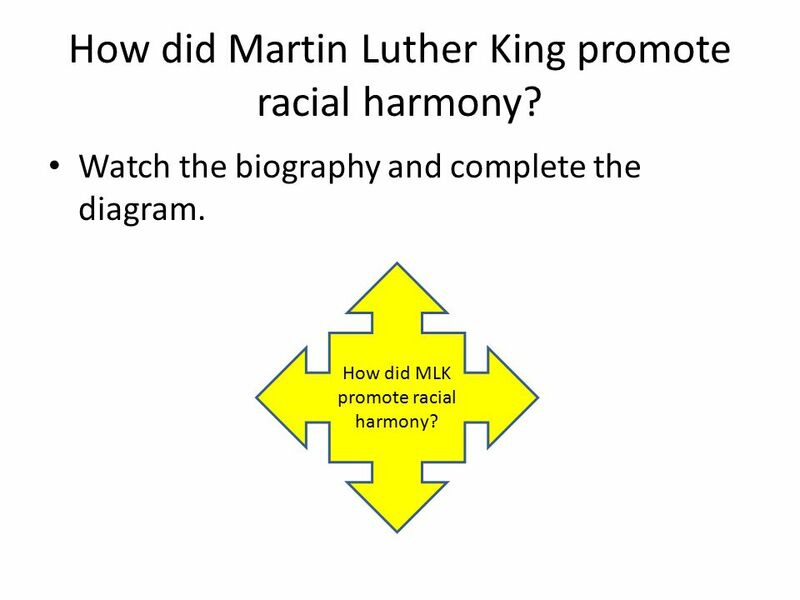 How did MLK promote racial harmony? 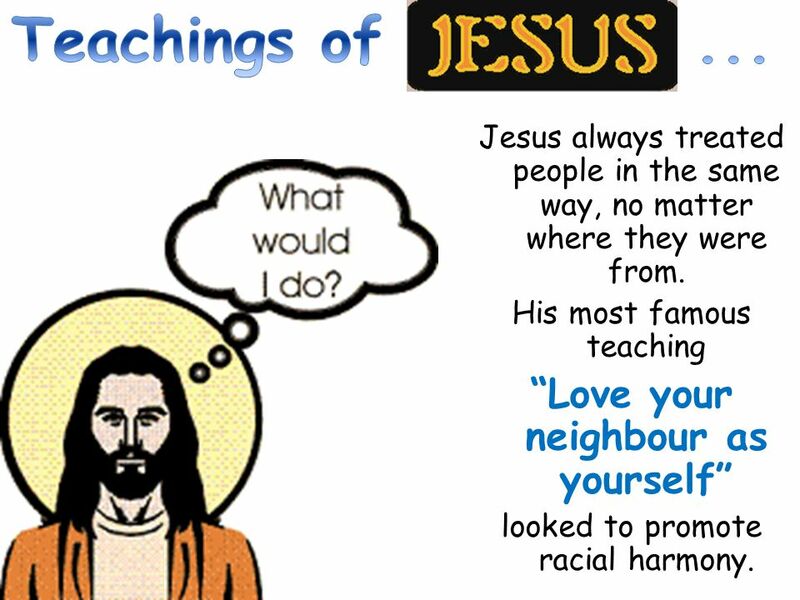 20 In what ways did Martin Luther King Jnr follow the teachings of the Bible and Jesus? 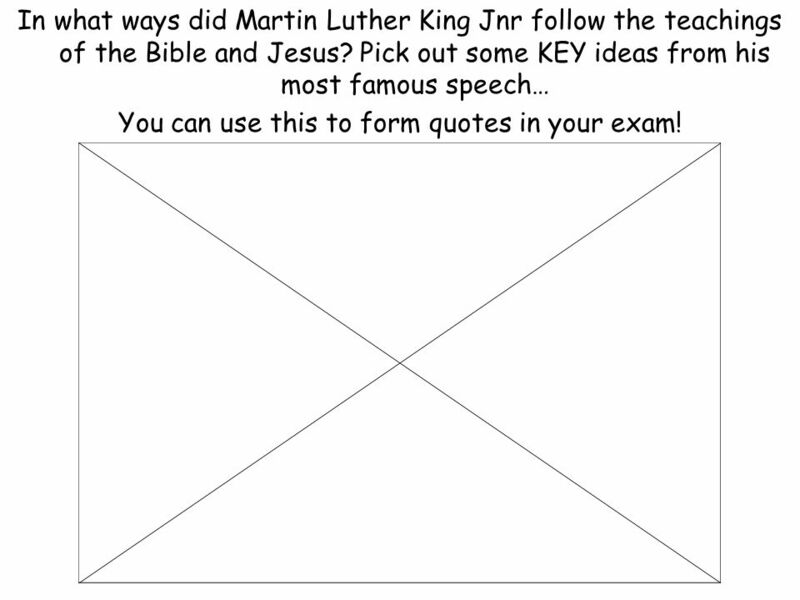 Pick out some KEY ideas from his most famous speech… You can use this to form quotes in your exam! 22 Split your page into four! The Church of England. 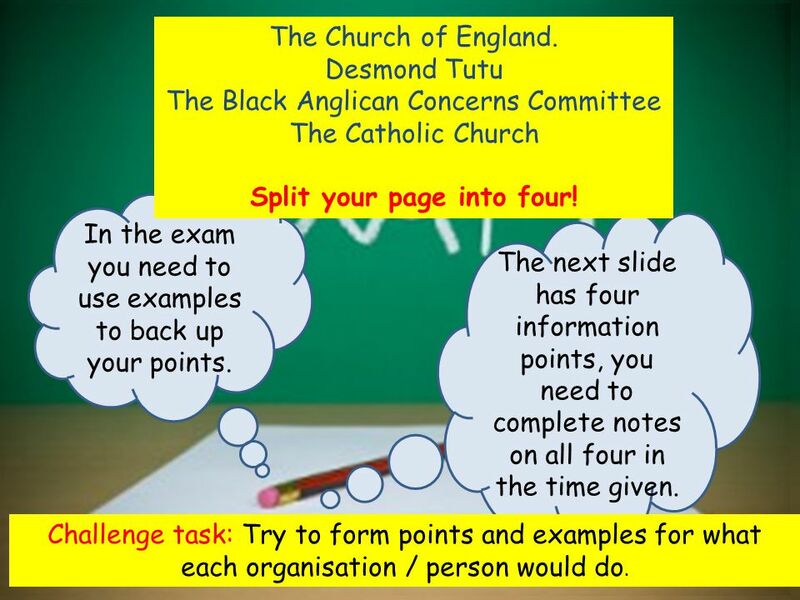 Desmond Tutu The Black Anglican Concerns Committee The Catholic Church Split your page into four! In the exam you need to use examples to back up your points. The next slide has four information points, you need to complete notes on all four in the time given. Challenge task: Try to form points and examples for what each organisation / person would do. 24 What do you think? 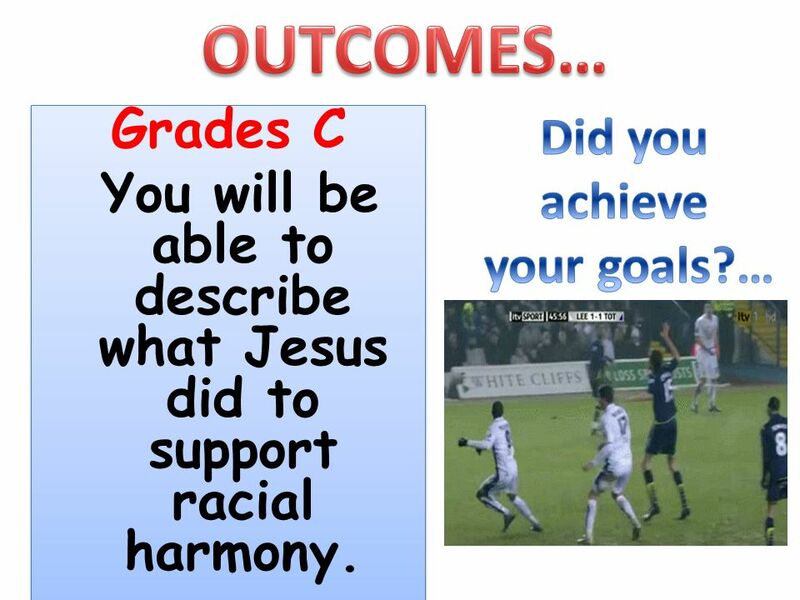 Part C 8 marks- remember for a full 8/8 you need to include a quote. PEPEPEPE Part B your opinion- remember you can argue either way. 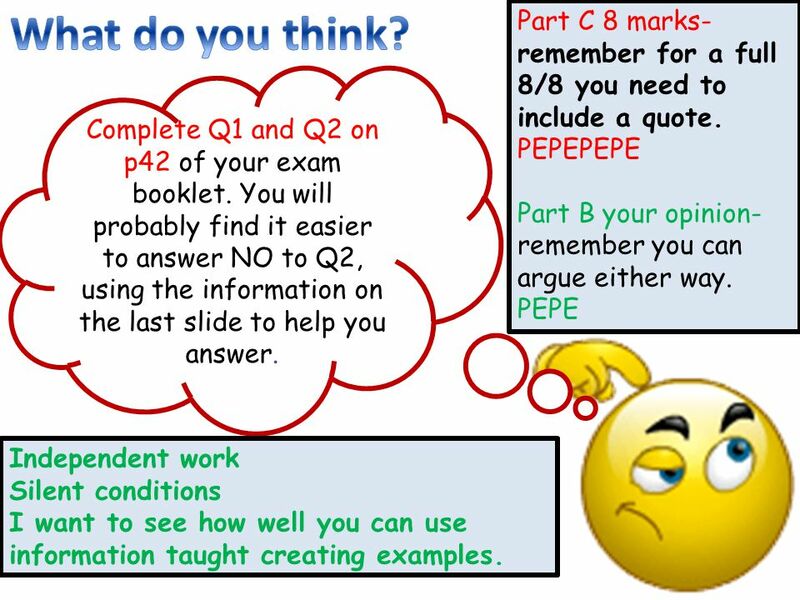 PEPE Complete Q1 and Q2 on p42 of your exam booklet. You will probably find it easier to answer NO to Q2, using the information on the last slide to help you answer. Independent work Silent conditions I want to see how well you can use information taught creating examples. 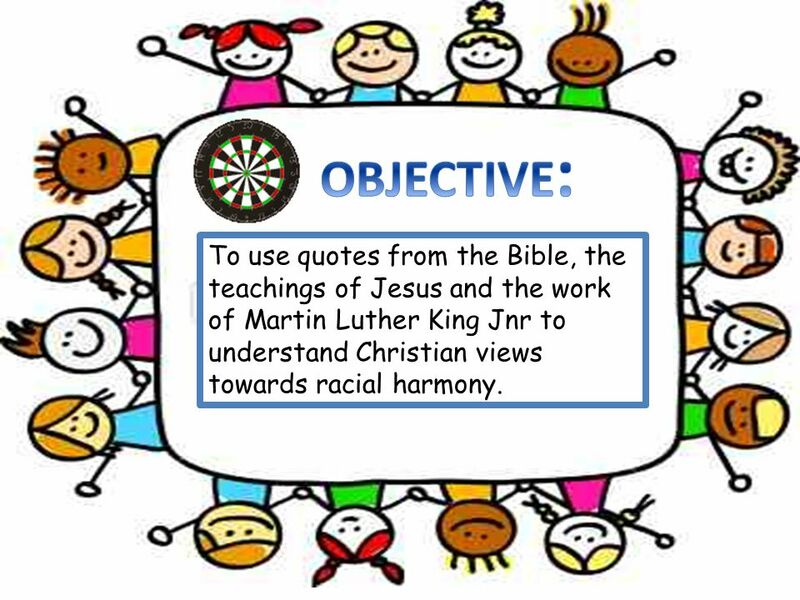 Download ppt "OBJECTIVE: To use quotes from the Bible, the teachings of Jesus and the work of Martin Luther King Jnr to understand Christian views towards racial harmony." SOCIAL HARMONY RE Revision. Social Harmony (a) What is a Multi faith society (2) (b) Discrimination is always wrong (4) (c ) Explain why there are different. Prejudice is the act of prejudging someone or something, and usually implies judging another person to be of less worth or value, based on little or no. 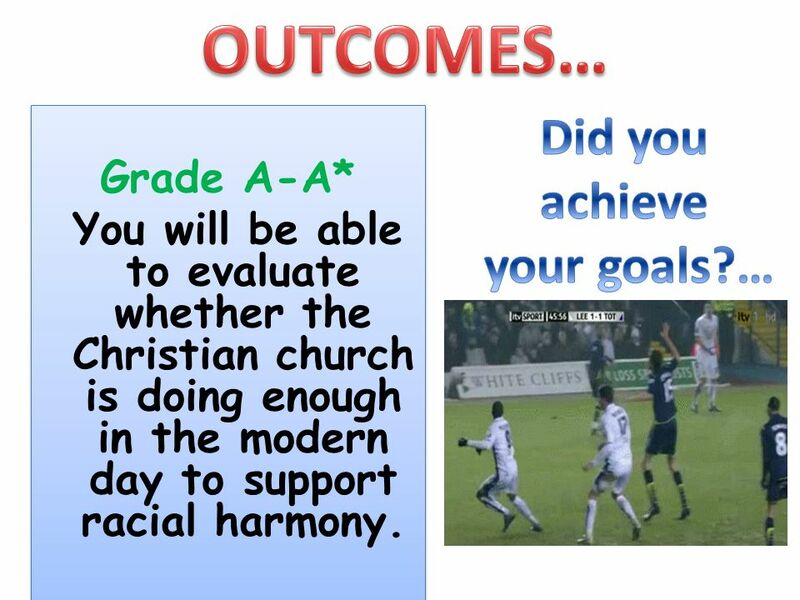 To use media clips and independent study to understand how and why religious people promote community cohesion. Community Cohesion A common vision and. To use media clips, the Bible and the teachings of Jesus to understand what Christians teach about JUSTICE. OBJECTIVE... To use media clips, independent study and pictures to understand the work of religious organisations in the fight to achieve world peace. 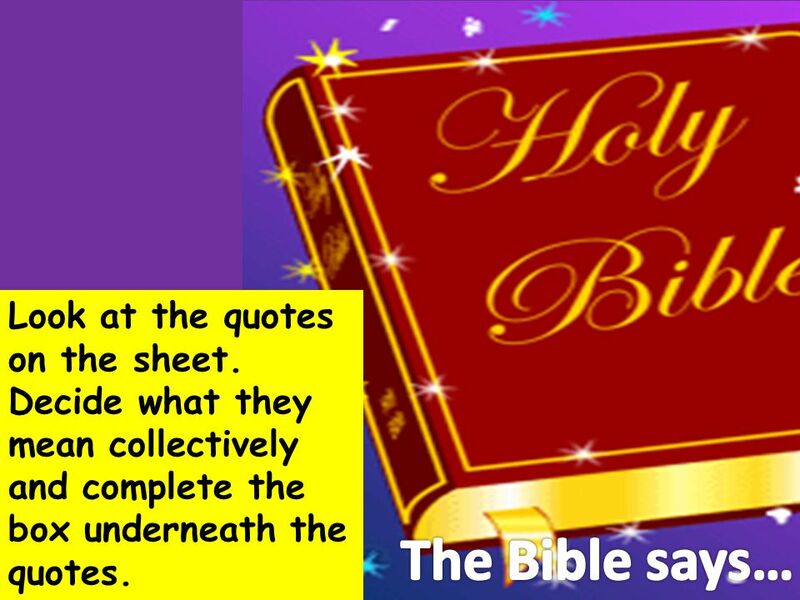 To use media clips, case studies, biblical quotes, and skills in comprehension to understand Christian attitudes to bullying. Prejudice & Discrimination Are all people equal, and should be respected equally? Or are some people different, and this makes a difference to how you. Pacifism Learning Objective: To understand the Christian belief in pacifism Key Words: Pacifism = non- violence. ALL (E GRADE): Will be able to describe what social injustice is and give examples of it MOST (C GRADE): Will be able to describe what social injustice. 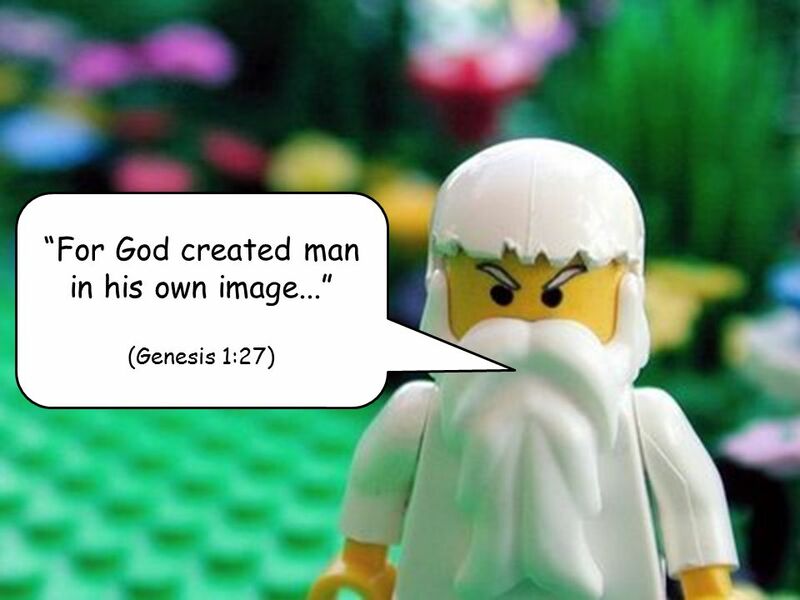 OBJECTIVE: The aim of this lesson is to use the Lego Bible and the Vicar of Dibley to help you answer an exam question about Christian attitudes to the. To use media clips, the Qur’an, Muslim teachings on Zakah and Shari’ah law to understand what Muslims teach about JUSTICE. Joint Schools Assessing Reconciliation – Inter Relating For our Joint Catholic and Church of England Schools.